A couple of weeks ago, we had the pleasure of hosting Rolf Molich, a UX and usability pioneer who has been in the industry since 1984, at two events here in the UK. 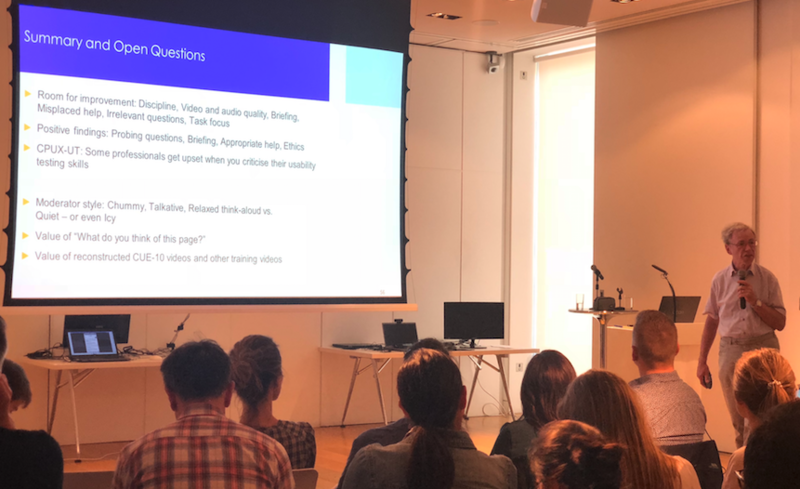 Rolf kicked off with a talk about ‘Ethical Dilemmas in User Experience’ at UX Sheffield (which we sponsor) followed by a slot at our very own half-day workshop, ‘What “Good” Looks Like in Usability Testing’. 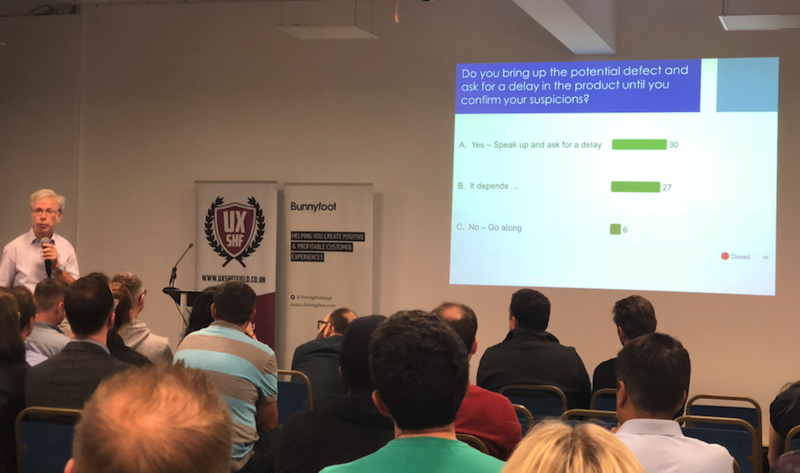 At both events, Rolf was speaking in front of nearly 100 people – from some of the UK’s biggest brands – addressing and debating the key issues within UX and usability today. Unsurprisingly, Rolf’s presentation at UX Sheffield about ethical dilemmas in UX contained examples of, well, dilemmas. What was surprising, however, was how often these dilemmas divided audience opinion. For example: when Rolf put forward the question, “Your manager asks you to design a gaming app aimed at children. You find out the client is Red Bull. What do you do?”, there was an interesting split between those who would go ahead and design it, no questions asked; those who would design it, but reluctantly; those who weren’t sure; and those who said they’d refuse. But who’s right? Well, actually – nobody. Designing an app like this is within the remit of a UX designer’s job, so it wouldn’t be unreasonable for your manager (or a client) to ask you to take on a project like this… so, if you wanted to do it, there’s no reason you shouldn’t. That being said, if a project like this made you uncomfortable, there’s nothing wrong with saying “no”. Because the scope of most websites/apps (etc.) nowadays is so vast, it’s almost impossible to find all of the problems/issues a website has through user testing; in fact, you would need a huge amount of participants to even get close. So, it’s unsurprising that, with a relatively small number of participants, it’s possible to test the same website and come up with different conclusions. That doesn’t mean that either is wrong; it just means you need to be aware that there may still be remaining issues that have yet to be uncovered. At both workshops, Rolf was keen to stress the importance of putting participants at ease during a usability testing session. As a UX professional, it’s your responsibility to make participants feel comfortable – at no point should they feel that they are the one being tested! You can do this by making eye contact with them, briefing them thoroughly, and making sure they are able to ask questions at any time. There’s also the matter of respecting their time; if you’ve invited them for a 45-minute session, do your best to keep the test within this time limit! Usability tests are hugely useful for finding the flaws in a user journey or user interface; if you watch five different people make the same error or the same incorrect assumption, it’s likely that you need to make changes. But what a usability test can’t do is tell you what the user thinks or feels about the web page they’re on or the journey they’re going through. Usability tests are about watching behaviours, not assessing an emotional response. We all want to strive for perfection in what we do. But sometimes, this need to do things perfectly can actually hinder us more than help. For example, at our London workshop, an attendee asked Rolf whether there was any point in them doing testing on their own site; they couldn’t ever be completely objective, so what was the point? Of course, there is logic to this viewpoint; ideally, you would have an impartial third-party to help you get the best, most objective results possible. But doing some testing – even if it’s moderated in a (somewhat) biased way – is better than doing nothing. Going back to the second point: if we went for perfection (finding every single issue in a website) every time we tested, it would be so time-consuming – and costly – that it wouldn’t be worth doing. Did you make it to UX Sheffield or our UX workshop? If so, what were your key takeaways from Rolf Molich’s talks? Let us know in the comments! We’re the UK’s leading usability specialists. Our work covers desktop, mobile, tablet – and more. If you think we can help you, get in touch. This post was written by Natasha Gray. Would you like to share it? Lift Buttons: A Usability Nightmare? What Do Michelin-Starred Restaurants Have In Common With User-Centred Design?